Last Friday’s launch of the UN Intergovernmental Panel on Climate Change (IPCC) Fifth Assessment report was met with significant media coverage and much activity in the climate change world – but will it change the mind of anyone not already supportive of the issue? At COIN we argue that climate change campaigners need to do more than explain the science: they need to inspire people by speaking to their values. 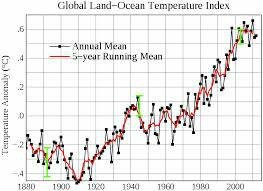 The new IPCC report re-emphasises the link between human activity and climate change, a conclusion reached by most climate advocates many years ago, but one which deniers have rallied against. Against this backdrop it is understandable that advocates focus on louder and clearer messages about the scientific consensus on human induced climate change. But evidence indicates that the science will fall on deaf ears unless communicators can show that social values– not science – are at the heart of the climate change debate. Since the high point of public support for climate action in 2008 - following the release of Al Gore’s film An Inconvenient Truth and public mobilisation around the UN’s Copenhagen meeting - it is clear that public concern and political enthusiasm have not kept up with the science. Apathy, lack of interest and even outright denial are more widespread than they were in 2008. Too often, campaigners assume that the facts of climate change will speak for themselves but we know that scepticism about climate change is more to do with people’s values than their knowledge about the science. Ignoring the psychological evidence on how to communicate climate change is a pretty unscientific way of communicating science. There are many reasons why the rational arguments of science and economics have failed to win the day, but an important one concerns human nature. Through a growing body of psychological research, we know that scaring or shaming people into sustainable behaviour is likely to backfire. We know that it is difficult to overcome the psychological distance between the concept of climate change – not here, not now – and people’s everyday lives. We know that beliefs about the climate are influenced by extreme and even daily weather. One of the most striking findings is that concern about climate change is not only, or even mostly, a product of how much people know. Increased knowledge actually tends to harden existing opinions. These findings, and many more, are increasingly available to campaigners and science communicators, but it is not clear that lessons are being learned. In particular, there is a great deal of resistance towards the idea that communicating climate change requires more than explaining the science. The IPCC report provides communicators with all the necessary factual information as well as a perfect opportunity to start a new conversation about climate change. However, COIN believes science should only be a small part of that conversation. To really capture the attention of the public, campaigners must fire the public imagination more effectively than climate sceptic arguments do. The arguments of environmentalists seem to be stuck in a rut but there is no reason why tackling climate change should be about saving polar bears or guilt-tripping people into changing their behaviour. We should be using the IPCC report to include a much broader range of voices in the conversation about climate change. The way to engage the public on climate change is to find ways of making it resonate more effectively with the values that people hold. Consider, for example, the finding that people with politically conservative beliefs are more likely to doubt the reality or seriousness of climate change. Accurate information about climate change is no less readily available to these people than anybody else. But climate policies such as the regulation of industrial emissions often seem to clash with conservative political views. And people work backwards from their values, filtering the facts according to their pre-existing beliefs. As part of a series of reports aimed at engaging ‘hard to reach’ audiences COIN recently () set out four new narratives for communicating about climate change with political conservatives. We showed how focusing on ideas such as conserving the ‘green and pleasant land’ or the opportunities of a more secure energy system could transform climate change from something associated with the left of politics to something that those on the centre-right could identify with. Similarly, a recent report from the Understanding Risk group at Cardiff University in the UK showed there are some core values that underpin views about the country’s energy system. Whether wind farms or nuclear power, the public judges energy technologies by a set of underlying values – including fairness, avoiding wastefulness and affordability. If a technology is seen as embodying these, it is likely to be approved of. Again, it is human values, more than science and technology, which shape public perceptions. However, an important caveat in this process is to ensure that you are communicating with people’s intrinsic values, such as altruism, rather than extrinsic, self-enhancing values. Appealing to people’s extrinsic values in the way that traditional social marketing does can actually undermine the collective battle to stop climate change. Advocating climate change mitigation on the grounds of saving money simply reinforces the idea that financial gain is the main reason for action, not climate change. When scientists tell personal stories explaining why they care about climate change, when campaigners speak effectively to audiences with a broad range of values and political views – that’s when climate change will break out of its minority rut. If you liked this piece, you can sign up for OurKingdom's weekly update here, join our Facebook here or follow us on Twitter here.